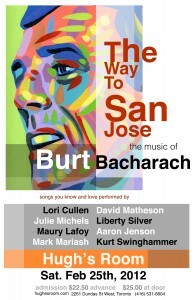 The great songs of Burt Bacharach performed by a unique collection of fantastic singers with a killer band in a tight, entertaining, two set show. The sold out success and artistic triumph of the gig last year made it an instant annual event at Hugh’s Room - the premiere Toronto showcase for music lovers. In addition a secret special guest has been confirmed as well. This multiple Juno Award winning artist cannot be named due to contractual issues, but we guarantee the audience will be delighted at the opportunity to catch this celebrated performer in an intimate setting. In all, 21 amazing songs by a terrific collection of performers. Show starts at 8:30 SHARP! It’s currently half sold out and tickets are still available, but reservations are seriously encouraged to avoid disappointment night of. 416-531-6604. 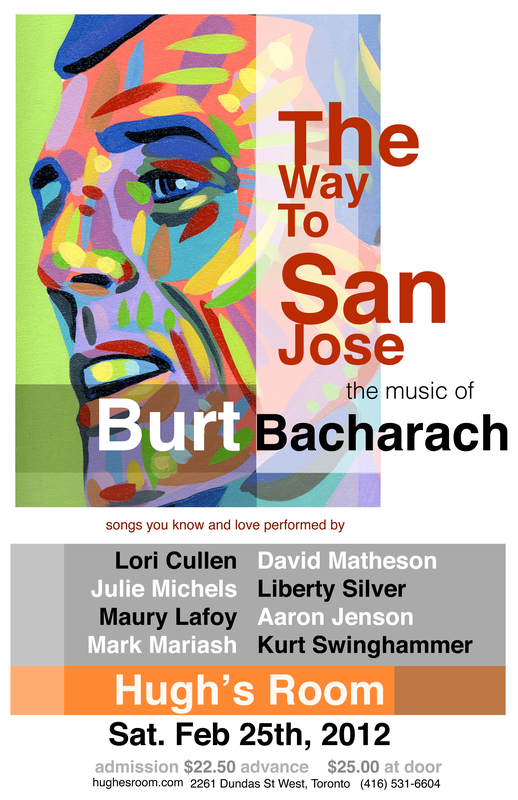 We were at the Burt Bacharach Tribute last night and were totally blown away by the depth and range of talent. We’re Hugh’s room regulars so have seen Lori, Kurt and Dave before (we’re also Betty and the Bob’s groupies) but we were also impressed with Aaron and Julie, and , of course, Liberty Silver! However, we left without leaving our email address for next year’s show. So please, sign us up!